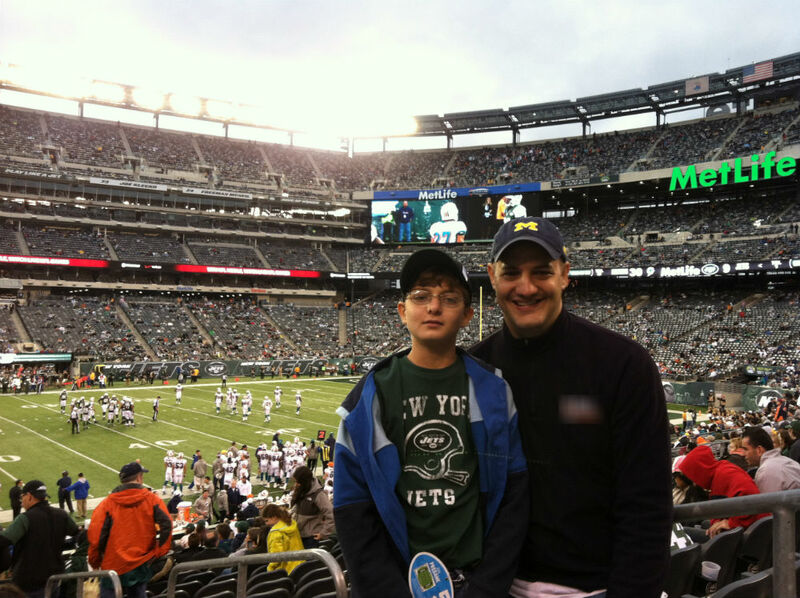 At the Jets-Dolphins game with Ryan, way back on Sunday, pre-Sandy. I have not been further from my house than a walk around the block since Sunday. I’m not complaining — I know how lucky we are that Hurricane Sandy spared us major damage, or even a loss of power when so many in my home state of New Jersey are suffering horribly. We have no Internet access. We can deal. My kids have been out of school all week. My office was closed Monday-Wednesday, and there was “no expectation” that people would make it in Thursday or Friday. Which is good, because I have no idea how I would get there. I suppose I’ll need to figure that out by Monday. But I want to turn back the clock those five days, back to Sunday, back to when life was normal. I have already told you that Sunday was no ordinary day. But I only told you half the story. Ryan scoring both his team’s goals — the first two of his hockey “career” — is a memory that will never fade, but what happened after was pretty special, too. Right after the game, as soon as the congratulations in the dressing room had faded, we were in the car and headed to MetLife Stadium for the second time in three weeks to see Ryan’s new favorite team, the New York Jets, in his new second-favorite sport, football. The trip was an unexpected treat. The tickets were offered by a friend with extras who had been following Ryan’s growing interest in the Jets via the blog. He called, quite out of the blue on Friday to offer the seats, and after checking the track of Sandy several times and deciding we faced no worse than passing showers Sunday afternoon, I gladly accepted. It’s hard to believe now, seeing all the devastation, that I spent Friday before the storm wondering if it would impact my efforts to see a live football game, but that’s the truth. I didn’t ignore the storm. I cleaned gutters, secured outdoor furniture, raised everything off the basement floor. I filled up both cars with gas (and boy am I glad about that decision now). We stocked up on non-perishables, batteries and bottled water assuming we might be without power for several days. Having done all that Saturday, I felt OK about taking Ryan to the game Sunday. I met my friend in New York to pick up the tickets. On my train home (I vaguely remember those) Friday evening, another surprise. My friend, who works in football, had reached out to someone at the Jets and secured for us a pair of pregame sideline passes. I was unsure how much Ryan would care about this added treat, but he was very excited when I told him we’d be standing just a few feet from the players during pregame warmups. He was downright fired up to be headed to another Jets game. Just after noon on Sunday, on a day that would already rank as among the most memorable of Ryan’s life if the day had ended right there, we attached our sideline credentials and were walked out onto the field to watch the Jets warm up. We walked past NFL commissioner Roger Goodell on our way down the tunnel. We passed Stephen Ross, the owner of the Miami Dolphins. To my disappointment, he failed to notice my block-M Michigan hat. He’s kind of a big deal in Ann Arbor. Next thing I new, we were standing just a few feet from the sidelines. Mark Sanchez jogged past. The Dolphins gathered in front of us to do their stretching and pregame drills, so close we could almost touch them. In fact, some offered high-fives to other sideline watchers. Ryan saw this and instinctively reached his arm out. This simple act made me smile. He’s had the opportunity to meet and collect autographs from several NHL players, but celebrity doesn’t usually interest him. Maybe it was because these players were in full uniform that he felt differently, but he clearly was thrilled to be standing so close. We spent about 45 minutes on the field before it was time to head upstairs to our seats. Ryan’s growing interest in the game was obvious from kickoff. He followed the play much more closely than our first visit just two weeks earlier. He was aware of down-and-distance, game situation, penalties, when teams should punt or kick a field goal. His same analytical approach to hockey was fully transferred to this new sport, and his knowledge of the game was stunning. He sounded like a veteran fan. C. has been a Jets fan his entire life. His family’s season tickets date to the birth of the franchise in 1960. Even he remarked that Ryan sounded exactly like a typical Jets fan. On Monday morning, Ryan played with his Football Guys. He’s had the set for years, but it has sat on the shelf in favor of Hockey Guys since he got it. Not any more. He played out an entire Jets-Packers game over the course of several hours. The Jets lost — badly. I knew my son had really become a Jets fan when I heard his imaginary crowd chanting for the imaginary Tebow after the imaginary Sanchez threw another imaginary interception. Who said kids on the autism spectrum lack imaginative play? There are many negatives about the ongoing NHL lockout, but one positive: I have gained a new football fan in my life. In doing so, I have gained a new entree into Ryan’s world, a new way to connect with him — or at least, a new spin on an old way to connect with him. I’m not changing the name of the blog to “Pigskins and Puzzle Pieces” — not yet, anyway — but I’m thrilled just the same to have this new bond with my son. Hey Dad, this is pretty cool. Mark Sanchez jogs by. Ryan would be booing him by halftime. How close did we get to the Miami Dolphins? This close. Posing with Ryan on the sidelines, pregame. This is becoming a familiar scene at our house. WOW! That is so cool. 🙂 I hope you can find a safe way into work on Monday. Sorry for the lateness of the replies. Today (Wednesday 11/14) I finally had a normal-ish commute. Progress! Sunday was a magical day…so many positives!! 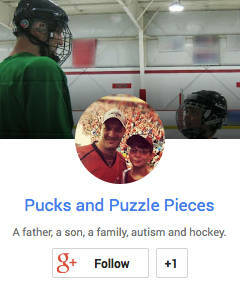 I love reading about the connection you and your son have. Awesome. Not sure where the Packers thing came from. Riley claims to be a Packers fan, although the only players she knows are RODGERS! (from his commercials) and Charles Woodson (she might have heard me talk about his Michigan exploits a time or two). So awesome! I’m glad you guys had such a great time. I’m also glad that you guys are safe. Sending good wishes to all of you in Sandy-affected areas. We got off easy, but the devastation is some nearby areas is unbelievable. Congratulations on the latest exploits of the Cheetahs as well!